Just Added, to the Legends of Surf portion of the Day. GOING OUT WITH GUNS BLAZING! THE 50TH ANNIVERSARY OF THE RUMBLERS, "BOSS"
Time to announce the line up for the 5th Annual SG101 Convention, 2012! It is with great pride and enthusiasm I present. The Venue will once again be the Starting Gate, in Los Alamitos, Ca. The Date is Sat. Aug. 11th. 10am to 8pm, doors open at 8 am. and what about pre-sale tix. (Nor. Cal. or out of state)and want to be assured a ticket to the event. Please e-mail me directly at Bigtikidude@yahoo.com, and I will put you on a list of guaranteed entrants. The Cost for the Convention this year will be 30 dollars. and Tiki Oasis is between 70 and 105 plus dollars. I don't think that I am gouging the attendees. I hope that everyone understand that there is 2 European bands, and 4 bands that are coming from East of the Rocky mountains, and The cost of travel these days is not cheep. I would like to be able to pay the bands well to help cover those costs. 10 Hours divided by 30 dollars is 3 dollars an hour. Is that really that much? There will once again be The (Fri.) Pre-convention BBQ at my place. And Pre-convention bar shows(Fri.)(San Diego, Anaheim, and El Segundo. Post-Convention party/show (at The Doll Hut in Anaheim, Feat. 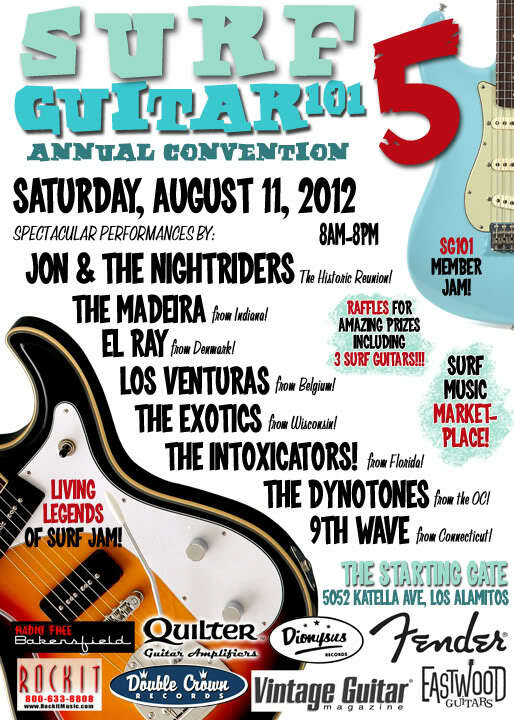 Slacktone,The Disasternauts, and The Tequila Worms). And Day after (Sun.) Huntington Beach pier show. 11am to 5 pm. Then Post Pier show surf jam with Matt Quilter's wave machine at Venue to be determined. mid week before the convention. There will probably be a Tour of the Fender Factory on Friday morning. And there will once again be the wildly popular Surf Music History Tour on Monday morning, of Balboa/Newport,&Huntington Beach. featuring El Ray, and Los Venturas. And Tiki Oasis, Aug.16th-19th ( www.tikioasis.com ) will be the weekend after the SG101 convention. And This Years theme will be (SPY). So I highly recommend staying for a week, and going to that also. The Bands are promised to be quite good at that yearly HUGE event. If possibly come out for a whole week, and soak in the So.Cal. scene! and Tiki Magazine for doing the great flyer again. How did I know you would be the 1st to reply to this Carol? All hail, Big Tiki Dude!!!! You've hit another home-run, Jeff! I'll be there for sure. The whole line up is absolutely stellar. AMAZING!! But man, I am really geeked up to see El Ray! and The Madeira. Wow, man. Wow. El Ray!!! How did you read my mind that I was hoping they would be one of the European bands this year? Every band is one that I so want to see. Needless to say, it's on our calendar. How can we patiently wait for August? they would be one of the European bands this year? and I am super stoked for the Jon & the Nightriders reunion show. and I either love, or have wanted to see all of the other bands involved. 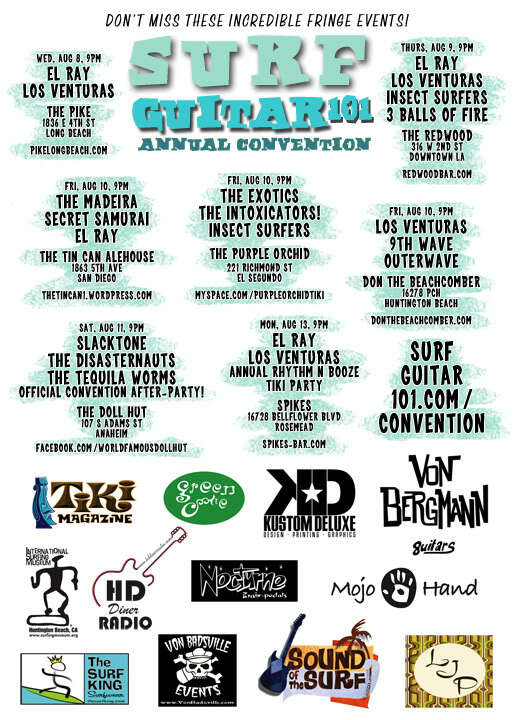 as this is truly a very varied show of different styles of surf bands. I just looked in our Playlist data base and notice that Phil Dirt used to play Los Venturas on KFJC, but he was using his own recordings - there is nothing in the KFJC library. Right now I am sampling them on MySpace and wow! Do I hear a sax? I just found out that I might miss it this year for work-related things I can't get out of. Hoping for the best because this lineup looks great. Let's Go Beach! Let's Go Beach! damn ... I live on the wrong continent ! Nope, you live near Surfer Joe's ! but I mean for the SG101 convention. the last time i was in LA was in 1999. It's about time to go there again..
We're looking forward to be back in the States and see you guys on SG101 '12. This year I am definitely making it out! Well, how freakin' exciting is this!!! What a lineup!!! An amazing job as usual, Jeff! We are absolutely THRILLED to be part of this convention, and we thank you very much for the invitation! The convention has really become a very special part of my life (i've only missed one so far, the second one), and I'm sure this one will be the best one yet. It'll be wonderful to see everybody again and get to take in all this amazing music. I can't wait!!! !